Cloughey boasts a long beautiful beach, ideal for walkers and watersports enthusiasts; the beach is serviced by a long carpark with a common. Cloughey Bay is very wide, but also shallow, which allows for safer bathing and paddling. The tide comes in right up to the edge, but when the tide goes out it leaves a extensive sandy shore that is ideal for exercising dogs and horses. There is a children's playpark on the shore, opposite the primary school, and a Somme Memorial Garden to stop and take quiet reflection. Extensive unbroken views across the Irish Sea to the Isle of Man and Scotland. To the north end of the Main Road, look out for Kirkistown Castle, believed to have been built about 1622. The castle comprises a tower house enclosed by fortified walls. It is open occasionally during the summer. At the southern end of Cloughey is a small supermarket and filling station with adjacent fish and chip shop. Ardminin Golf Course - situated in a scenic spot overlooking the Irish Sea, just 5 minutes from Portaferry and Kircubbin. This nine hole treat is perfect for starting a day’s touring with a quick round featuring water hazards, challenging holes and other parkland pleasures. Enjoy lunch in the fully licensed bar and restaurant before exploring the Ards Peninsula. Castleboy - The remains of a tower house believed to be 15th Century can be seen to the left from the road to Portaferry from Cloughey where the road begins to twist. The Castle was active until at least the late 17th Century. It was the commandery of the Ards belonging to the Knights of the military order of St. John of Jerusalem (who are now called the Knights of Malta), who were instituted to protect the Christians of the Holy Land and pilgrims going to Jerusalem. The castle was destroyed before 1744, where reference is made to "the late monastery of St John of Jerusalem". Cloughey and District Tennis Club - We are a small but active tennis club established in 2008, and based in Cloughey, on the Ards Peninsula in County Down. We play all year round on our all-weather, floodlit courts. In 2016, Ards North Down Council replaced our 2 old courts with 3 new 'state of the art' outdoor carpet courts for all-year-round play. Anyone thinking of taking up tennis is welcome to have a free trial without any obligation to join. Kearney Village - - A showpiece village carefully restored by the National Trust to give the authenticity of a traditional fishing village. The village lies three miles to the east of Portaferry, with views across to Scotland, the Isle of Man and the Mountains of Mourne. The Trust owns a number of cottages at Kearney and these have been restored in the vernacular style giving authenticity to this place of character. 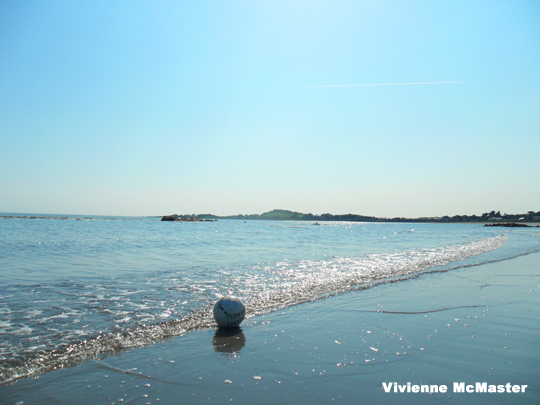 From Kearney village there are attractive walks to the beach at Knockinelder, and along the shore to Stinking Point. The paths lead through lichen-covered slaty rocks and coastal grassland studded with spring squill on the promontories. The small, sheltered bays are made up of shingle and saltmarsh, with the yellow horned poppy, an unusual plant of the area. Kirkistown Castle - The precise date of the construction of Kirkistown Castle has been debated recently, but it is traditionally believed to have been built by Roland Savage of Ballygalget in 1622, possibly reusing an earlier site. The castle comprises of a three storey tower house within the remains of a bawn (fortified enclosed space) and a later barn. There has been gradual subsidence of the tower house over the centuries as its foundations were not built to accommodate the marshy ground. In the late 19th century buttresses and two iron braces were added to halt movement in the walls. The tower has been subjected to numerous alterations over its history and was extensively remodelled in a neo-gothic style in the early 19th century. Kirkistown Castle Golf Course - now in its 113th year, has rolled with the times and has been an enduring central landmark within the townland of Kirkistown and the small village of Cloughey. Our current membership consists of approximately 800 members across various categories from the young and young at heart, to the golfing fanatics as well as those who simply enjoy the food, drink and great craic that makes our Club atmosphere so enticing. Whether member or guest, everyone is most welcome to come and experience our wee corner of the world. Kirkistown Race Track - There are seven car race meetings, four sprints and two single venue rallies per year. There are also a dozen track days. Gearbox karts feature on the main circuit at some car meetings and non-gearbox karts have their own events on the Kirkistown West circuit. We have at least two motorbike race meetings. There are also bicycle race meetings, duathlons, motorcycle track days and race schools for both bikes and cars. Slanes Graveyard - The graveyard is situated within a former rath, or ringfort, an enclosure of the first millennium A.D, and is surrounded by a white wall. Within it are the ruins of a medieval church which is believed to be the Church of Ardmacossce or Ardmacaisse, mentioned in the Taxation of Pope Nicholas, 1306 , along with an unusual cross-carved boulder. Aerial photography has indicated that the graveyard is in fact the nucleus of a much larger enclosure, which survives below ground in the surrounding fields. At a time, it was the main graveyard for the Cloughey/Kirkistown area, and was also the burial place for many poor sailors who lost their lives on the notorious Cloughey rocks. The graveyard has an outstanding 360 degree view of the surrounding countryside and outside the wall there is a souterrain, approx. 50 metres in length which was quite accessible until recent years. The site is Scheduled for protection in recognition of its historic importance. 'Most of the oldest gravestones are of slate and the earliest readable date of death is 1677. The White House, Ballyspurge - On the coast, two thirds of a mile south east of Cloughey village. This house appears to have been built about 1634 by Roland Savage, a cadet of the Ardkeen family, and is typical of the gabled house that about that time began to supplant the square peeltower. It was enclosed in a bawn of courtyard, of which little now remains but the gateway. The gables are thick and contain immense fireplaces and chimneys. Each face of the house is pierced with numerous gun loops. Access for viewing is available all year round.